As of right now I really don’t know why their services are down. I have been inclination with their support on Twitter and they don’t even seem to be aware of the issue on their own servers. Microsoft states all services online yet thousands of users can’t access their email for over three days. So far they have recommended that I fill out this form to report the issue. I encourage that all of you reading this post with the same problem fill the form out as well. Hopefully they will finally start to realize they messed up and can finally fix their stupid systems. Below is an image of the error that I have been receiving. It doesn’t really provide much insight as to what is going on. I have clicked through and reported the issue numerous times but it is still been over 3 days without access to my email. This is ridiculous. I hope none of my emails are lost in cyberspace. I understand that their free email services are a low priority to them because they don’t make money (or at least lot of it) from the service but they should at least give a crap about their reputation, or what’s left of it. I’ll do my best to update this post from time to time as I receive information or if I am able to once again access my email account. Until now I have update my address at important websites to a self hosted email address. Now at least if there is a problem I am responsible, I have to fix it, and I am aware of it. No more having to depend on some other company that doesn’t care about its users. Follow Tech+ on Twitter and Facebook to keep updated! UPDATE 2/23/2013 6PM CST: Still no email access. Still no update from Microsoft. I recommend you call their support like and try to get some answers. 800-642-7676 Please let us know what they tell you! UPDATE 2/23/2013 9:45PM CST: I finally have access to my email account. 847 unread emails… Great…. I will update again once I confirm others have access as well. UPDATE 2/23/2013 10:30PM CST: Well, I have access to my account but it would appear that many others still do not. This must have been one heck of an outage. My best guess is that they are going server by server repairing whatever damage was done. Hopefully in time everyone else will regain access to their accounts. 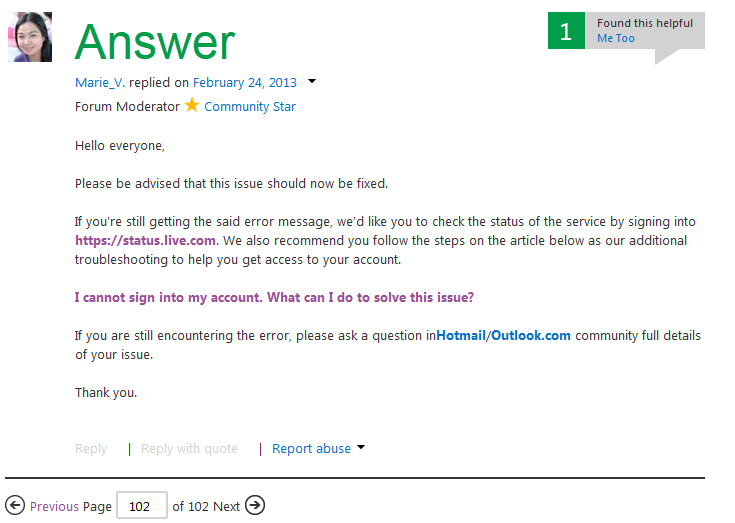 UPDATE 2/24/2013 9AM CST: From the looks of it everyone should once again have access to their Hotmail accounts. 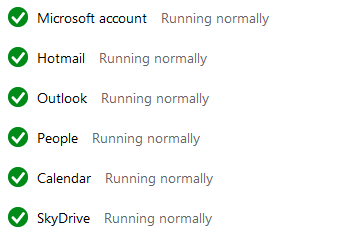 Microsoft has yet to say why this happened. We deserve an answer. This is what they posted as the final post on the thread I’ve been following.